In 2001, first reports of the human draft genome were published. Since then, genomes of many other organisms have been sequenced, including several primate species: the chimpanzee, rhesus macaque, gorilla, orangutan, gibbon, baboon, marmoset, tarsier, galago, lemur, and more recently Neanderthals. In a new era of "post-genome biology", scientists now have the vast amount of information revealed by genome research to confront one of the most challenging, fundamental questions in primatology and anthropology: What makes us human? 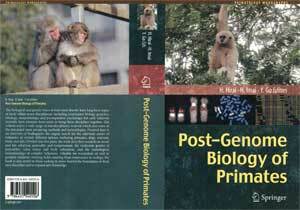 This volume comprises a collection of articles on a variety of topics relevant to primate genomes, including evolution, human origins, genome structure, chromosome genomics, and bioinformatics. The book covers the cutting-edge research in molecular primatology and provides great insights into the functional diversity of primates. This valuable collection will benefit researchers and students, including primatologists, anthropologists, molecular biologists, evolutionary biologists, and animal behaviorists.